John Legend Performs The National Anthem Live at The World Series!!! John Legend to Perform National Anthem at World Series!!! Major League Baseball says the Grammy-winning singer-songwriter will perform the national anthem before Game Two at Yankee Stadium Thursday. New York natives Jay-Z and Alicia Keys will warm up the audience with their single “Empire State of Mind” before Legend sings. John Legend and his HUGE pecks take a walk in Miami…. John hit the streets of Miami with his dog and his bike for a good workout. The man’s pecks are the business. I’m jealous, gonna have to hit the gym now lol. I’m trying to understand why an artist would go through all the trouble of re-invention only to contradict it. The album couldn’t have delivered that promise more. John and Kanye were at the helm of the project’s production and with the help of The Louis Vuitton Don “Evolver” ended up being the best John Legend album on record… or at least the most interesting and listenable. Fourteen tracks that make the proceeding projects seem almost as conservative and one dimensional as they were. Not to say John hasn’t had some very entertaining moments prior to Green Light. “Heaven” and “Ordinary People” are two of his best but there’s never been this much outside influence before. Brand new tracks “Satisfaction” “Quickly” “No Other Love” and “It’s Over” are my favorites! 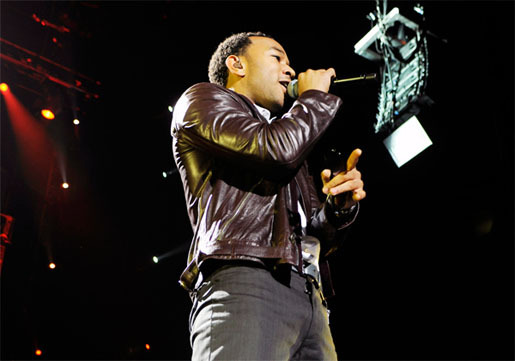 While the new album shatters expectations John Legend himself remains the same…. To me that means that Kanye talked him into alot on this project. For the second single John reveals his true colors, colors that the game and the fans know all too well. “Everybody Knows” sounds like something right of the first two albums. Why would you get everyone to believe that you changed and then contradict yourself??? The fans bought the album and know what’s up but for those that needed more evidence it’s not looking good. His second single should have been “Satisfaction” or “It’s Over” in my opinion, though many other tracks would have been appropriate. As a result of this second single momentum has nearly died and he may or may not get approved for a third single… We’re not all Mariah Carey…no shade. As far as this album’s promotion goes Mr. Legend is going to have to choose that next single very very very carefully and deliver a great video to get back in the game. Life’s going to be little harder now that Jamie Foxx has dropped his new album not to mention the fact that D’Angelo, Ginuwine and Trey Songz will all be on the shelf by mid summer. JOHN LEGEND RECENTLY CELEBRATED HIS 30TH B’DAY WITH GIRLFRIEND CHRISTENE TEIGEN. THE EVENT WAS HELD AT A BOWLING ALLEY CALLED “LUCKY STRIKE”. APPARENTLY SOMEONE GOT HIM A BALL WITH HIS FACE ON IT…I WANT ONE…WELL WITH MY FACE ON IT NOT JOHN’S LOL. YOU CAN PICKUP JOHN LEGENDS “EVOLVER” RIGHT NOW, AS WELL AS AVANTS NEW ALBUM THAT DROPPED YESTERDAY, ROBIN’S PROJECT “SOMETHING ELSE” THAT IS MAYBE A MONTH OLD AND JAMIE’S “INTUITION” WILL BE ON SHELVES DECEMBER 16TH. ALL IN ALL I’MMA BE WRITTING UP ALOT OF ALBUM REVIEWS. TO FIND OUT HOW TO BECOME A FEATURED ARTIST WITH TRUECLEFMUSIC AND EXPOSE YOUR FACE & MUSIC TO THE THOUSANDS OF VIEWERS THAT GET THERE MUSIC MEDIA HERE EACH MONTH CLICK ON THE MIC. Awww yes… Estelle has had an amazing 2008 thanks in part to friends in high places and mostly to a very fresh, different sound. Her runaway smash hit “American Boy” killed radio and the charts this year making her one of America’s finest imported goods.